I made these very simple brussels sprouts with the filet mignon. I love making sprouts but until last year I was only making them for Thanksgiving. Considering how yummy and healthy they are, I decided to cook them more often. I have tried quite a few different recipes but I like roasting them the tastiest. They get nuttier and sweeter and it so easy to place them in a cookie sheet and roasting them in an oven. For these ones, I made a garlic paste with salt and a bit of olive oil. I also added my favorite ingredient- smoked paprika. I slathered the paste all over the sprouts and roasted them for about 20 minutes. Thats it – it was as simple as that. I am currently obsessed with smoked paprika. I want to add it to everything I cook. I love the smokiness and kick it brings to anything. I had a few filet mignon steaks in the fridge and I decided to take the Latin route and use some smoked paprika. I made a rub with roasted cumin seeds, smoked paprika and salt- very simple, yet super flavorful. The roasted cumin mimics the smoked paprika flavor without the kick. It is a wonderful rub for any meat as well as fish. I marinated the steaks over night but you can leave them for at least 2 to 3 hours. I then concocted a sauce. My initial plan was to use some tamarind concentrate with chipotle sauce, etc. Unfortunately, I discovered I was out of tamarind- oh, no, what will I do?? I looked in my pantry and found an unopened bottle of tamarind jam that I purchased years ago from St. Maarten. I took it out and mixed it up with a few other ingredients and came up with a delicious sauce. If you don’t have the same jam, you can use any other like apricot or raspberry. I served the steaks with brussels sprouts and Spanish rice. The whole meal was delicious, flavorful and quite healthy. I avoided the rice but ate lots of sprouts..
Just a couple days left until we fly back home. It has been a good trip, filled with great food, family visits and some shopping as well. I love going away on vacations to new and old places alike.. but more than that I love going home. I like relaxing and taking it easy where ever I am but I really look forward to going home and getting back into my routine- I feel a bit lost without it. Anyway, I was saving the best for last. As I mentioned before, a trip to Delhi for me means a trip to Bukhara, which is a high-end Indian restaurants serving my favorite kind of cuisine- kebabs, etc. I saved this visit for almost the end of my trip- there really wasn’t any other time to go. As I mentioned in my previous post, I also went to a place called Colonel Kababz, which is similar to Bukhara but very down to earth with prices to match. The food there was spectacular and I had something to compare to. We walked into the very fancy Mauryas Hotel, covered in beautiful and expensive marble. A very pleasant, flowery aroma followed us to the restaurant in the back of the building. The space was exactly the same as I remember more than five years ago. We sat down and were brought the menu right away. We ordered seekh kebabs (minced goat meat with spices cooked on a skewer), barrah kebabs (chunks of leg of goat with the bones, expertly marinated), bukhara dal (dal makhani) and two pudina paranthas (bread topped with dried mint- my favorite). We sipped our bottled water and waited for the food. The kebabs, dal and bread came promptly. 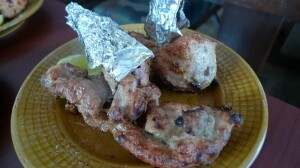 The barrah kebabs were delicious- perfectly marinated and super flavorful, especially with the bones intact. 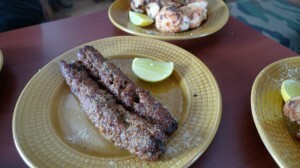 The seekh kebabs were okay- nothing special, especially since I was able to do a direct comparison with the other place. 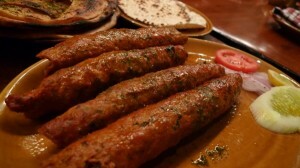 Colonel Kababz seekh kebabs were far more superior – they were tender and almost melted in my mouth. 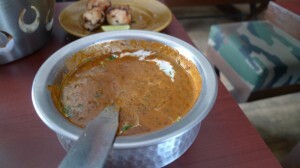 The famous Bukhara dal was adequate- not as good as the one I had the other day. I was quite disappointed. I have no problem spending big bucks for fabulous cuisine- but it has to out of this world. This experience was good but nothing outstanding. I am not sure if I will return to Bukhara- it doesn’t seem worth my time or money, especially when I can get better food for a quarter of the money. More than a week has already passed. When we planned the trip, two weeks seemed a lot of time to do all sorts of things. 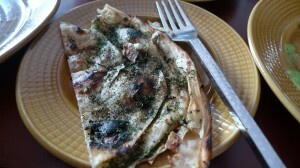 The rest of the time will be spent eating my all time favorite part of Indian cuisine- tikkas. Tikkas are tender morsels of any meat, marinated in different spices to perfection and then cooked in a clay oven or tandoor. The result is melt-in-your-mouth taste that is out of this world. We do have decent restaurants in New Jersey serving these preparation, but nothing can compare to all the places here in Delhi. We made our way to Colonel Kababz near by. 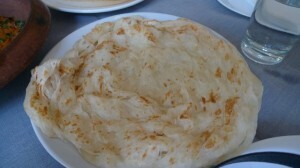 I was super excited to try all sorts of things including dal makhani and pudina parantha. We ordered the malai kebab (tender chicken pieces in a creamy marination), kalmi kebab (chicken legs cooked to perfection), seekh kebab (minced goat meat with spices), dal makhani and lots of bread. 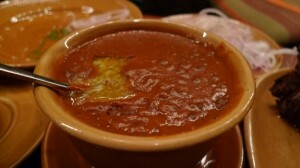 The meal was delicious- the meats were prepared with just the right amount of spices and the dal was out of this world. We noticed the thick layer of butter on top of the lentils and for a second I thought of removing it- but then I proceeded to eat it exactly how they served it. The butter makes it more delicious. 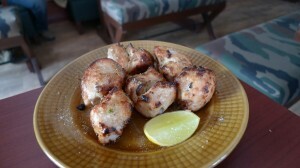 My daughter loved the chicken tikkas- found them a bit spicy but managed to eat it. 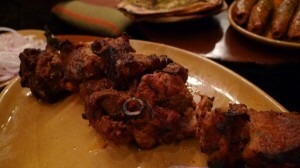 My next stop- Bukhara– my all time favorite place to go for this cuisine. It is a must for me every time I come back. This time it is after five years and I am really looking forward to it. Will take lots of pictures and report back…. 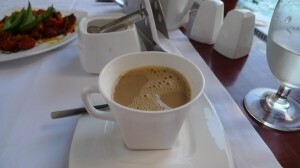 Day three started with the usual breakfast and a pot of South Indian coffee. It was our last day here and we wanted to make the best of it. We got ready and walked by the ocean to the main tourist area. After visiting a few shops, we decided on a seemingly local and modest restaurant for drinks and lunch. We were expecting some really delicious cuisine at extremely reasonable prices. We ordered a beer and a fresh lime soda (lemonade). The prices were not modest at all. The fresh lime soda was not well made and we were not happy. We decided to cancel our calamari masala and go across the street to Hotel Brunton Boatyard- a beautiful, old building set by the ocean. We walked in and they showed us to their restaurant set in a beautiful yard overlooking the ocean. The warm breeze welcomed us as we sat down- we knew we had made the right decision. 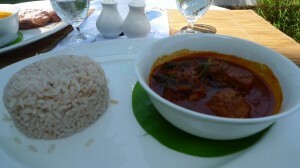 I ordered something called a Meen curry, which was fish of the day cooked in local spices with red rice. My husband decided on a prawn curry served with noodles made with rice dough. Both the dishes were wonderful but the shrimp dish was outstanding. We sat back and enjoyed the view, the delicious food and the awesome view. The trip was short but chockfull of amazing food and some good shopping. 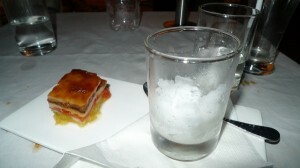 I ordered a lemongrass coulis and guava ice cream for dessert. I love guavas but was not sure how the two flavors would complement each other. 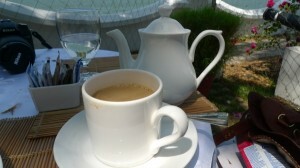 Of course a pot of coffee came as well – it was my last chance to enjoy the delicious coffee before we left Cochin. The dessert was amazing – the two flavors were made for each other. The experience was wonderful- the service was outstanding. We were greeted as we left and we promised to come stay with them when we return…. 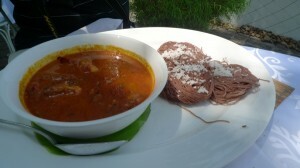 Day two started with a buffet breakfast filled with Western and South Indian dishes. The best part for me was the coffee- yes I know I keep going on and on about it but I do love it. We walked by the ocean for a while and took a three wheeler to another part where we were looking for a place called Grand Hotel. Before reaching the hotel we stopped at a spice market filled with peppercorns, cardamoms, coffee, vanilla beans and ginger candy. I bought a bunch of stuff and headed to the hotel. It was a modest space with a large restaurant. The food was supposed to be outstanding with extremely reasonable prices. We found the place and walked in. 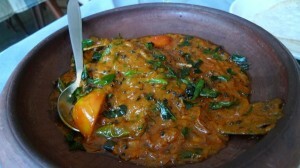 We had also read about a specific fish curry called karimeen. It is a back water fish and was highly recommended. We ordered the fish masala, a prawn curry and bread. I had glass of fresh lime soda- which is essentially lemonade made with club soda instead of water. As we waited for the meal, I noticed everyone enjoying their food around us. Finally the food came.. the fish curry was the best we have ever had. It was a perfect combination of onions, ginger, garlic, mustard seeds and curry leaves. It was a whole fish and we got busy trying to get every bit and avoiding the small, sharp bones. It was an amazing dish. The prawn curry was good but the fish took the cake- so to speak. 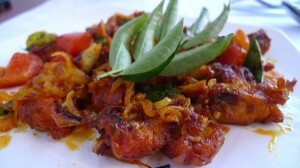 Dinner was at Malabar Junction, a restaurant in Hotel Malabar House. I opted for the tasting menu- a seven course, long meal. The first two courses were okay, a bit bland. I asked our server to make my food spicy- I reminded him I was Indian and could handle whatever came my way. The next few courses were nicely spiced and delicious. 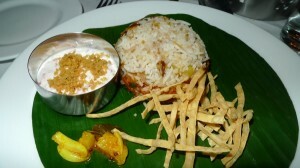 The sixth course stood out – it was fish biryani and spiced yogurt. It was delicious, flavored rice with delicate morsels of fish. The dessert was stewed fruit in a Napoleon shape with a sorbet. It was a good ending to the meal but the fish curry from the afternoon stood out as the clear winner. It my first time here in the south western part of India in Kerala. We are in Cochin right by the Arabian sea. I have been looking forward to this trip as I have never been south of Mumbai. The culture, language and food are completely different down here. In fact the common language is English. We reached here yesterday afternoon after a 4 hour flight and an hour long drive to our small, boutique hotel nestled by the ocean. I can see the boats and ferries passing by from our room- it is quite beautiful. We arrived exhausted from our journey and as we walked to our room, I noticed they had a massage center. Perfect.. I booked a massage and went down for a snack of fried fish pieces sauteed in curry leaves and a big pot of South Indian coffee. The coffee here is delicious- very different from the coffee I have back home. It is nuttier and not as complex as some of the other coffees. I love it- it is served with the milk cooked right into the hot beverage. I was happy and looking forward to my massage. In the evening we headed into the town and walked around looking at all the stores filled with spices and lots of silk handicrafts. I can’t wait to go back and buy some peppercorns and cardamom. We found a local seafood restaurant called Oceanos restaurant. Most local restaurants don’t serve beer or wine- so we had a delicious ginger lime soda. They brought a glass with a bit of lime and ginger concentrate with a bottle of club soda and a little container of simple syrup. 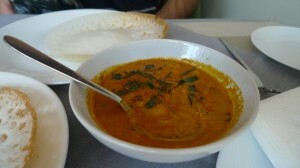 From the menu we ordered a green mango shrimp curry, a Kerala chicken curry, lemon rice and an appam (local bread). The mango shrimp curry was amazing- great combination of savory and sour. We asked for the curries to be medium spicy as my husband doesn’t do spicy. I asked for a pickle on the side to make it spicier for me- the pickle was amazing. The food was really good and so was the dessert- it was panna cotta with honey figs- absolutely delicious. Somehow I was not expecting to eat a panna cotta in South India. The South Indian coffee was amazing- as usual. As we finished, the chef came out and asked how everything was. We complemented him and asked about the mango pickle. He promptly went into the kitchen and filled a jar of it and refused to take any money for it.